The inspiration for this immersive video room came from developing the learning outcomes for the exhibition. 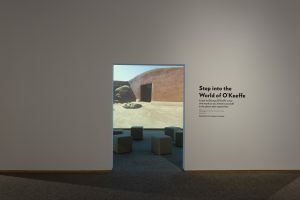 The outcomes included learning about the places that inspired O’Keeffe and the themes within her work, such as desert landscapes. 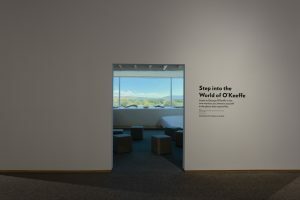 One of the other outcomes explored how O’Keeffe was an innovator in the art world through her exploration of space and scale. These outcomes led the interpretation team to want to create something that matched the size and scale of O’Keeffe’s artwork. 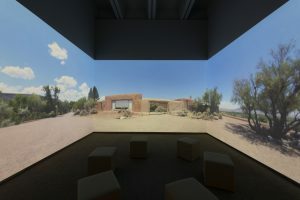 The interpretive contracted with a film production company in Raleigh to travel to Santa Fe and capture footage with a 360 camera. 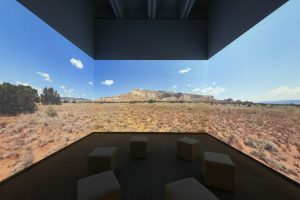 The interpretive team worked with the O’Keeffe Museum and Ghost Ranch, while also using the checklist from the exhibition, to identify iconic places where O’Keeffe painted. The team spent four days in the area traveling and filming. WNET also has one of the only audio interviews with O’Keeffe talking about her work. We incorporated and aligned her audio to images in the video so visitors would not only see the places that inspired her, but hear her talking about them as well. 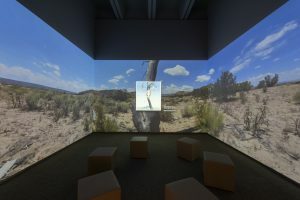 One of the other ways we expanded the life of this experience beyond the exhibition, the interpretation team worked with the film producers and other museum departments (Teaching and Learning, Public Programs, and Marketing) to use the footage to: (1) create an online version of the 360 video for teachers (https://learn.ncartmuseum.org/resources/okeeffe360/); (2) create a virtual reality experience that was used during gallery pop up programs, community events with local businesses, teacher resource fairs, and the opening exhibition party; (3) create photo projections as large backdrop images as part of public programming events.